How delighted I was when I came upon Love and Spirit Medicine the second book by Shonagh Home. I immediately felt a strong connection to Shonagh, checked out her extensive website, and devoured her book. 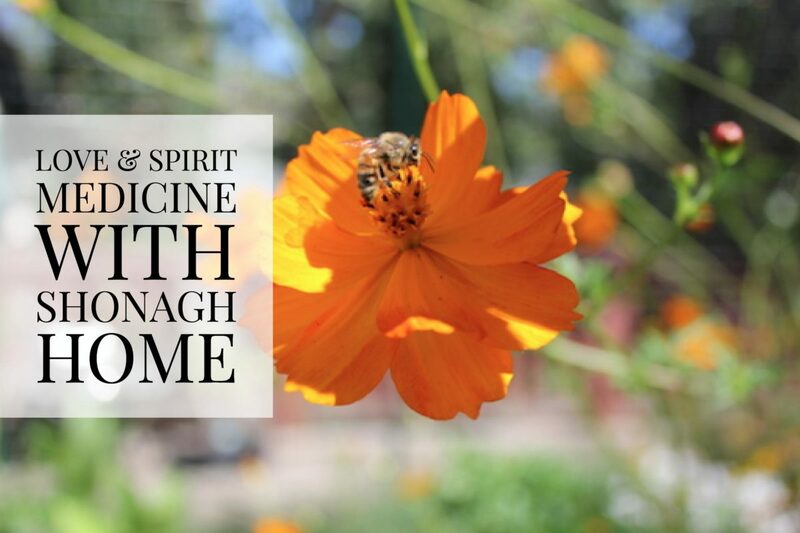 In Love and Spirit Medicine, Shonagh shares her very personal and intimate journey as she evolves from one chapter in her life to the next and as the shaman in Shonagh emerges so too does the empowered women. This transformation involves her relationship with entheogenic mushrooms, her supportive friends, the men in her life, and ultimately with herself. I asked Shonagh if she would share with us more about her book and her journey. CAROLINE: Shonagh, thank you so much for joining with us today! 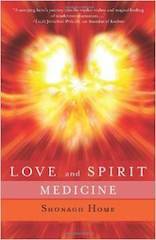 Love and Spirit Medicine is beautifully written and very personal. Your style of writing from your heart touches the reader deeply as if we are reading our own story. Please share with us your writing process. SHONAGH: I’m so glad to hear that the book touched you. When I am quickened to write, the words flow very easily. I think of it in this way: essentially my muse shows up at my front door and announces the arrival of a book that I am to write. Once I feel the presence of her, the writing flows with ease and the hours melt away. I become very magnetic in that feminine, yin way and the words pour forth. Then the masculine process of formulating the structure and cadence of the writing sets in and I find myself in a balanced place where I can both receive and structure information. So, I see it as a harmony between the masculine and feminine processes. The book details a dark night of the soul that I experienced via my love relationships. Writing about the experience was incredibly cathartic and healing. In writing the book, I turned my pain into medicine. CAROLINE: Your book describes your death and rebirth process. How did the mushroom medicine help guide you during this transformation? SHONAGH: The mushroom medicine is a profound mystery that cannot be neatly categorized and assessed by our reductionist, material science viewpoint. It is an ancient intelligence that works with each seeker differently. I chose to work with it in a very shamanic way, where I engaged a monthly ritual process of taking a large dose at night, lying down outside in nature with my eyes closed. Thus began a series of medicine experiences where I was greeted by Mother Earth who proceeded to reveal to me my behavior patterns and the deeper whys behind them. The medicine gave me profound insight into what drives me along with a clearer understanding of the people I was involved with at the time. During my explorations I developed a relationship with a spirit familiar in the form of a white owl who announced herself as a guiding presence for me. This was followed by a series of synchronicities where the veils between the worlds thinned to almost nothing as I experienced confirmation after confirmation that spirit was assisting me throughout my journey. This was profoundly humbling and comforting and it made it possible for me to go very deeply into my pain and heal myself. As a result, I have tremendous clarity around that experience and who I am as a person, what drives me, what is my Achilles heel, what are my strengths, etc. The mushroom was my great assist in the sacred journey of “know thyself.” That said, this medicine is not for everyone and the sad truth is that there is no touchstone for how to work with sacred plant medicine in western society. We are taught to abuse in this culture and most people abuse these medicines with no understanding of the profound healing they can offer, which is a crying shame. CAROLINE: Was there a turning point for you, when you realized the journey was an inward one and your relationship with yourself was the one that was transforming? SHONAGH: Yes, the turning point was the medicine journey where White Owl Woman came to me. I had the feeling that everything that had happened up to that point was designed to get me to that place of realization. She kept “calling me “Daughter Who Longs” and told me I would be birthed from Daughter Who Longs” to “Daughter Who Knows.” In that journey I was told that the girl in me, the needy grasping, insecure girl had to die so the wise woman could lead. It was in that journey that I realized I needed no one else to be my other wing. I had my own set of wings that could carry me to great heights. The months that followed were like a training ground for me where I would gravitate back to “Daughter Who Longs” and then connect with “Daughter Who Knows.” These things begin in the mind and then our actions must follow and bring the thought into manifestation. So, it was a process and a worthy one because I am in a place today where I am very comfortable in my own skin and very comfortable being my own person, no relationship necessary. Essentially, I fell in love with my own soul and experienced a connection with my inner temple. That has been a huge game-changer for me. 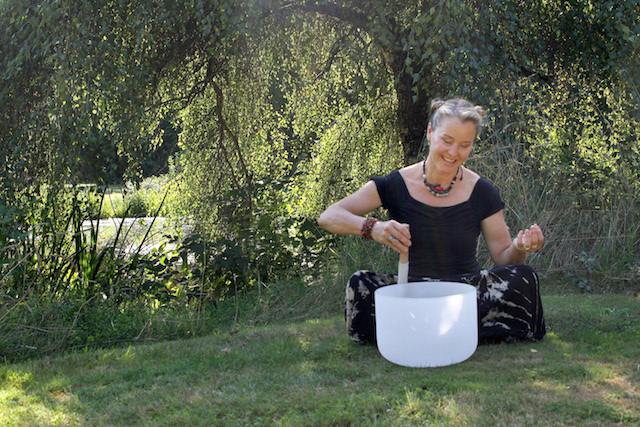 CAROLINE: The mushroom medicine allows you to open up to an expanded consciousness and to connect you with other realms and spirit beings to bring forth information. Especially fun for me to read in the book was your connection with the Pleiadians. Can you share some of that with us? SHONAGH: Yes, that was most unexpected. For a year, I was visited by nature spirits that included Pan, with White Owl being the most prominent teacher. These teachers would temporarily possess me and speak through me. I discovered that this is a very old form of shamanism that was traditionally practiced by women. (Think the oracles of Delphi and the Volvas of the Norse traditions). The night of the Venus transit, June 6th of 2012, I decided to go through the portal as I felt that was a huge cosmic doorway that had opened at that time. I took 6 grams of medicine and had a good friend with me who took just a tiny amount. To my surprise I felt a very different energy come through me. I had an understanding that these were “star beings.” They had a wonderful sense of mirth and fun to them. They seemed genuinely delighted to be communicating with us and they referred to us as “daughters of Mu.” They talked to us for a couple of hours and impressed upon us the power of words to cast spells and bind us to “programs” that do not reflect our inherent nature. In fact, they emphasized the necessity of reconnecting with nature on all levels in order to initiate the planetary healing that is so desperately needed at this time. They continue to inform me and they always bring through their message with incredible love, wisdom and wit. In fact, they are extremely funny and whenever I feel them around me I feel the frequency of mischievous mirth that gets me smiling. We all have the ability to connect with these beings either through our own doing or through someone who can open as a temporary gateway for their frequency to flow through. Truly, we have no idea just how possible it is to travel extra-dimensionally. Our culture gives us no clue to the deeper mysteries of the human potential. There is so much to be explored and so many wondrous intelligences willing to communicate with us. CAROLINE: You are located in the Pacific Northwest, a ways north of where we live in Ashland. I would love to know more about your workshops and the personal sessions that you offer your students and clients. SHONAGH: I work with both men and women in my private practice, where I bring in owl medicine, which focuses on shadow material. In this way, issues, patterns, and deeply held secrets have an opportunity to be addressed and healed. The spirits or “beings” (as I call them), that I have engaged through the mushroom medicine work with me when I am in a session or teaching. This gives me much deeper insight into the matter at hand. For my classes, I teach a medicine wheel class that follows the Peruvian model. I teach classes on the blood mysteries where we explore the power of the once venerated womb. My classes also explore oracular work, along with bee medicine, and the two are related, going back to the Minoans and the Greeks. I have a new class that I will develop into an ongoing offering called, ‘The Woman In the Shaman’s Body,’ named after Barbara Tedlock’s book. I am developing this into a year-long mystery school where I will share shamanic wisdom teachings, connection to the celestial and terrestrial forces, oracular development in which one learns to tap into the extra-dimensional realms, and more. Teaching is my passion and I am forever researching, experimenting and exploring, then sharing with all who are curious and motivated to seek higher knowing. CAROLINE: Love and Spirit Medicine is your second book. Could you tell us about your first book Ix Chel Wisdom: 7 Teachings from the Mayan Sacred Feminine? SHONAGH: Ix Chel Wisdom is a love letter to women. I have spent time in the Yucatan working with a beautiful shaman teacher who opened me to the mysteries of the Mayan Cosmic Mother, Ix Chel. Ix Chel is mother of the earth, the moon, fertility, the waters, and the healing plants. My book details my initiation into her mysteries and the ensuing messages I received from her that call women back to sacred ritual in honor of their feminine nature. It is a simple but profound little book, and I continue to hear from readers who were touched by its message. I also posted videos on YouTube called, ‘Ix Chel Wisdom,’ that share some of her messages and my thoughts around them. My work with Ix Chel sparked my full moon ceremony offerings that I held for over four years at my home in the Pacific Northwest. Gathering women together for sacred purpose is something that is dear to my heart as it calls us to a higher way of relating than the cultural model of competitiveness, gossip, etc. CAROLINE: Jason and I are beekeepers and I’m excited to read the book you are currently working on about sacred beekeeping. Please give us a preview. SHONAGH : I am in love with my bees! I’ve been stewarding them for the past three years. My book begins with the story of how venerated bees were by the ancients and I explore their influence on the Mediterranean priestesshoods. I then describe the harsh reality of the modern-day situations our bees are experiencing, after which I explore a powerful solution in the form of biodynamic farming and gardening. This is a methodology brought forth by Rudolf Steiner in 1924 as a solution to the damage done by chemical fertilizers and pesticides introduced after WWI. Biodynamics came out fourteen years before organics yet it is still relatively unknown. It’s about revitalizing the soil by igniting the forces of the celestial and the terrestrial realms. It heals the entire eco-system on which it is applied. Our bees require safe and nourishing forage and the application of these methods restores a level of vitality back to the land that affects not only the bees but also all other life forms. It produces potently nourishing foods for humans as well. The bees are our canary in the coalmine and they are warning us that if we do not change our ways of working with the earth, we are going to lose everything we hold dear. I hold the bees and all of earth’s wonders very dear indeed. CAROLINE: That sounds truly wonderful! I’m looking forward to co-creating a deeper experience with our bees. It has been amazing speaking with you today Shonagh. Can you please share closing words of wisdom to help others on their journeys? SHONAGH: We have to remember that we ARE nature. As within, so without. Our mind/body reflects the natural world around us as well as the universe above. We have only scraped the surface with regard to our true potential. There is so much more to discover for those of us who are endeavoring to unlock the mysteries of who and what we are and what is this mystery called “life.” Society and all it entails is merely a construct held together by consensus agreement. What is “real” is nature and our essential spirit. That to me is the true technology that is waiting to be tapped. We are told we only use 10% of our brain. Well, that leaves quite a lot of uncharted territory that is waiting for the intrepid ones to arrive with curiosity and courage. Life is a wondrous exploration with many diversions. It’s a game worthy of kings and queens. My hat is off to all who know in their hearts that there is more, much more to be discovered. CAROLINE: Thank you so dearly, Shonagh, for talking with us today about Love and Spirit Medicine and sharing more about your journey and your loving insights! 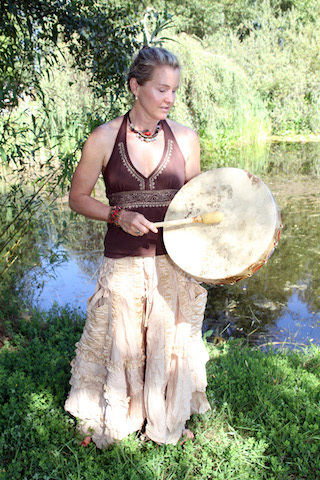 I encourage everyone to visit ShonaghHome.com and experience Shonagh’s beautiful writings and shamanic offerings. Please note: Entheogenic mushrooms are illegal to use in many countries including the United States. Caroline Ra does not use or recommend the use of entheogenic mushrooms. As with all sacred medicine, entheogenic mushrooms are to be honored for the healing wisdom they offer.